BLHS were delighted to welcome back John Leighfield (after a gap of ten years) as November’s speaker. John successfully managed to enthuse us all with the history of maps, and to engage us completely by showing how Bicester was depicted on maps over the centuries. We were introduced to an array of notable map-makers. The first was Gough, who in c. 1360 produced a manuscript map of the British Isles (now in the Bodleian Library). This map is remarkably accurate as far as its depiction of England, and with its roads, pathways, and towns could still be used to navigate today. However, it was the 16th Century which marked a map-making revolution. This was fuelled by three key factors. First, the arrival of printing presses. Second, the fear of military threats/invasions (many parts of the south coast had been mapped under orders of Henry VIII in fear of the Armada). Third, the advancement of ‘surveying’. With the dissolution of the monasteries, Henry VIII was keen for his lands to be surveyed. This led to a number of people becoming skilled at surveying and map-making. Most notable of all was Christopher Saxton, who is recognized today as the founder of map-making in Britain. At this point of the talk, John asked the BLHS members whether they had ever heard of Christopher Saxton. Sadly only a few hands were raised. John then urged members that if they only remember one name from his talk, let it be Christopher Saxton. Saxton was a Yorkshireman, born in about 1542. His patron was Thomas Seckford, Master of the Court of Appeals and Surveyor of the Court of Wards and Liveries. 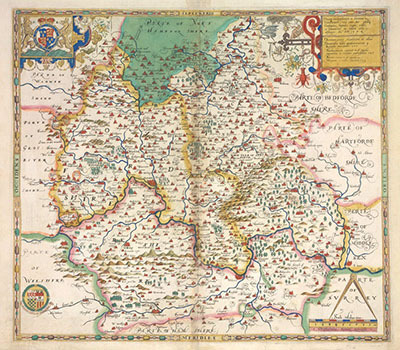 It was Seckford’s money together with the authority of Queen Elizabeth I that led in 1579 to the publication of one of the first regional atlases of any country in the world. From the early 1570s Saxton travelled around England and Wales, surveying and drawing all the counties, empowered by Elizabeth’s authority to climb the highest buildings to help him see the lie of the land. To produce his maps, Saxton used a compass and other equipment, including a wheel measure, chains (each chain measured 22 yards), and surveying instruments. Interestingly, roads weren’t included on the maps since they weren’t deemed important enough, however rivers did feature. The maps were first drawn then engraved and then printed. With the assistance of one English and three Dutch engravers, 38 very fine and highly decorated maps were produced, which made up the atlas. Bearing in mind the means of travel available to Saxton, the fact that no one had mapped most parts of the country before, and the sheer quality of the result of Saxton’s work – this was a truly remarkable achievement. In 1590 Sheldon had four tapestries made (now on display at the Ashmolean Museum). These tapestries used Saxton’s maps, with the addition of a view of a town or village. Saxton’s maps were reproduced again to illustrate the 1607 edition of Britannia by William Camden, with engravings by John Kip and William Hole which are of a very fine quality. Another well-known map-maker was John Speed. In 1611 he published his atlas, the Theatre of the Empire of Great Britain. Speed openly took the work of others (mainly Saxton) as the source for his maps, then decorated and added to them in a way that made them uniquely attractive. He was the first to show the ‘hundreds’ on county maps, and he was the first to include small plans or views of major towns. He also added a significant amount of heraldry into the framework of the maps. He did not revolutionise the mapping of the country, but in some ways is a worthy successor to Saxton. Speed’s atlas was extremely popular, and was published in countless editions until 1770. Up until the late 17th Century, roads were notable by their absence in maps. In 1675 that changed dramatically when John Ogilby produced his Britannia. This was a monumental work, containing one hundred plates illustrating in considerable detail the principal roads of England and Wales. His work can be seen as the basis of ‘strip maps’ that have continued until the present day. Once Britannia had been published, the road information it contained was added to the plates of the classic earlier atlases such as Saxton and Speed. Britannia itself was copied and produced in reduced format by other map sellers for more than a century. We learned about plagiarism in the map-making world – maps were constantly copied by map-makers both in this country and abroad. In 1740 one map-maker was copying the new roads onto his map, when he came across a village with no name, so he added the word ‘quare’ (Latin for query) against it on the map, as a note for him to investigate further. However, he forgot to do this before the map was printed. So, for many decades afterwards, a small village in Wiltshire was known as Quare! 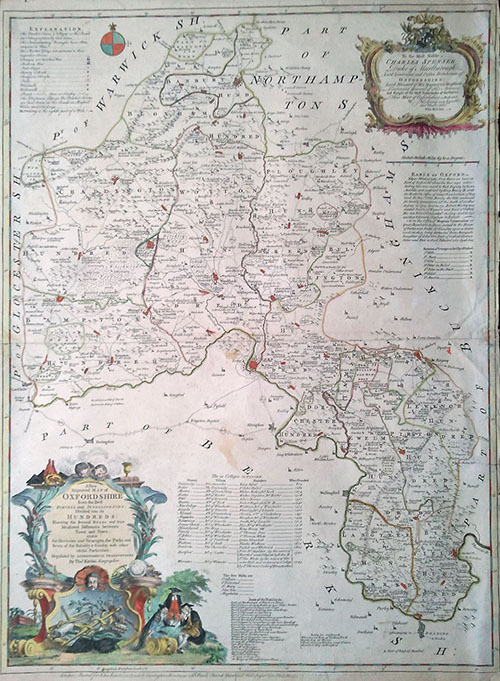 A major leap forward in the mapping of the counties took place in 1759, when the Society for the Encouragement of Arts, Manufactures and Commerce (now the Royal Society for Arts) issued an advertisement offering a prize of £100 for an original survey of each county at one inch to the mile. Between 1759 and 1802, twenty-three surveyors submitted entries and thirteen were successful. Oxfordshire was surveyed by Thomas Jefferys. This was a very detailed and accurate map with a decorative title and a detailed plan of Oxford. It was engraved on four copper plates by John Cary. The military threat (this time Napolean) led in 1792 to the establishment by the army of the Ordnance Survey. The country was surveyed in horizontal bands from north to south; and in 1801, the first one-inch-to-the-mile map was published, covering the county of Kent. The southern part of Oxfordshire was reached in 1830. These maps were very detailed and accurate, and most important, consistently surveyed. We then heard about the ‘battle of the scales’. From 1842-1863, a lengthy and noisy political argument took place as to the scale at which the Ordnance Survey should continue its work. This culminated with a decision in parliament to use all the scales proposed by the various proponents: 1” to the mile for general topography; 6” to the mile for mountains/moorlands; 25” to the mile for cultivated areas; and an amazing 10 feet to the mile for built up areas with a population greater than 4,000. The work of the Ordnance Survey put British map-making in the pre-eminent position in the world – a position it retains to this day. Today, the advance of satellite imagery has revolutionized the production and indeed our use of maps. Sat nav in cars is almost the norm, and Google maps on the internet offer instant accessibility to traffic hotspots and street views of almost every corner of the country. However, one slightly sad statistic given (after seeing such an array of beautiful old maps) was that today paper maps account for only 5% of maps used. 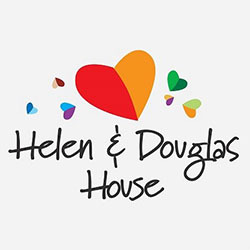 John’s talk was given in support of Helen & Douglas House Hospice, and excellent detailed (localized) hand-outs were supplied to the audience.